In your interaction with 212areacode.com, we may collect any personal information you enter on our Web site or provide us in any other way. You may choose not to provide certain information, but then you might not be able to take advantage of the many features and services we offer. Below are examples of the information we collect. Contact Information – including your name, mailing address, phone number and email address. Purchase Information – including your credit card number, billing information, and number porting information, that includes but is not limited to your account number and account details in order to complete the porting process. Demographic Information – including your age, personal interests, and product preferences. If we are provided information about others, or if others provide us your personal information, that information will only be used for the specific reason it was provided. For example, our Refer-A-Friend option on our Web site. 212areacode.com does not sell or rent your personal information to third parties. We may also share aggregated data with third parties for analysis and research purposes. This data does not contain name, address or other identifiable personal information. At times, we may be required to share personal information in response to a valid court order, subpoena, government investigation, or otherwise required by law. We also reserve the right to report to law enforcement agencies any activities that we, in good faith, believe to be unlawful. We may share certain personal information when we believe that such release is reasonably necessary to protect the rights, property, and safety of other and ourselves. Additionally, we may also transfer personal information in the event of a corporate sale, merger, acquisition, dissolution, or similar event. Call us at (212) 580-2000 x3 with your current contact information. If you send us an email, please be sure to include your full name, address, phone number, and email address, along with the specific changes you would like to make to ensure we correctly identify you in our systems and accurately process your request. All requests to change your personal info will be processed within 15 business days or less. Until your requested change takes effect, you may still receive marketing communications from us. While shopping online in the 212areacode.com shop, we use reasonable security measure to protect the confidentiality of your personal information under our control and appropriately limit access to it. 212areacode.com cannot ensure or warrant the security of any information transmitted to use by e-mail, and you do so at your own risk. We use a variety of information security measures to protect your online transactions with our company. 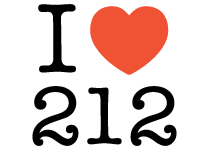 The 212areacode.com Web site uses encryption technology, such as Secure Sockets Layer (SSL), to protect your personal information during data transport. SSL protects information you submit via our Web site such as ordering information, including your name, address, and credit card information. You may choose to set your browser to not accept cookies. However, without enabling your cookies, you will not be able to view, create an account, or make purchases on the 212areacode.com Web site. Our Web servers automatically collect Clickstream information such as the address (URL) of the Web site that you came from before visiting our site, the pages you visit on our site, the browser you use to view our site and any search terms you may have entered on our site, among other things. Our Web site may also use other technologies to track which pages our visitors view. This anonymous Clickstream data provides our customers with a better overall site experience and helps 212areacode.com understand how visitors use our Web site. Our Web site uses third party advertising, third party service providers to serve ads across the internet and to analyze Web site traffic on our behalf. They may collect anonymous information about your visits to our Web site and your interaction with these ads. These companies may use similar technologies previously outlines to measure the effectiveness of ads and e-mails. They may also use information about your visits to our Web site so that we can provide advertisements about goods and services that might be of interest to you. No personally identifiable information is collected in this process. We may share anonymous information with these service provides in an aggregate form for the purposes of analysis and improvement of our site.